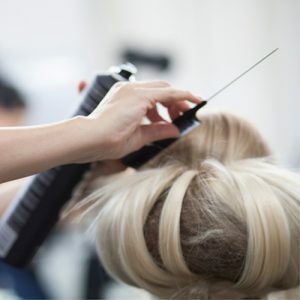 This course concentrates on the basic fundamentals of hairstyling, from simple blow-drying techniques to creating elaborate hairstyles. Students will learn to create modern styles, as well as edgy and creative hair designs, using hot tools and roller sets. This course incorporates daily projects and skill-building sessions, to encourage learning by practice. As part of this course, students are required to complete hair and make-up projects, which relate to on-the-job experience. Hairstyling is the sculpting of hair with classic techniques. We use hot rollersin a variety of ways to show students how to build a hairstyle and teach howto master the use of marcel irons. We do not just want the student to be ableto duplicate a look, we want them to understand how a look was createdand how to recreate it using techniques that will help that style to last underthe rigors of a demanding production schedule. Hairstyling anyone who wants to learn to be specific for makeup artists, can our education ‘Make-up Artist Level III: Hairstyling Essentials follow. A training is required for non-MUD students. This training lasts 70 hours. MUD and thus makes the difference. This is the only program that focuses specifically on hair and make-up artistry. After this course you are ready for the next make-up challenge!